The etiology of primary bone tumors, as well as the etiology of tumors of other systems is not clear. Of course, many factors are involved, such as heredity, some early injuries and diseases (e.g. Paget’s disease), etc. Recent data on the human genome revealed the genes which possibly have to do with some forms of primary tumors. The diagnosis is usually based on clinical and laboratory findings, CT-scan imaging and biopsy data. The main clinical symptom is unexplained pain which is localized, progressive, continuous, persisting even during rest and aggravated at night. Depending on the age of the patient, it is rather logical to assume the presence of a tumor. For example, children may have Ewing’s sarcoma, adolescents and young adults may have osteosarcoma, middle-aged people chondrosarcoma, while the elderly patients develop metastatic processes. There is localized pain and sometimes swelling. The general condition of the patient is affected only in the most severe cases. Besides that, a pathological fracture can often be the first symptom of the disease. Biopsy is performed to reveal the final diagnosis and determine the nature of the tumor. The investigation is conducted either by means of the closed method with the use of the needle / trocar or by open operation. It requires experience and special expertise to perform the biopsy. The expertise of an experienced, qualified specialist is of crucial importance. In the case of benign tumors surgical treatment is usually recommended. Tumor resection by means of scraping or brushing cystic lesions followed by filling with bone implants is usually performed. In the case of cancer, surgery (with radical resection of even healthy tissues, and, significantly less usually, with amputation) is combined with radiotherapy and chemotherapy if considered appropriate. In order to replace a significant part of the bones or joints of the involved areas, specially designed prostheses (custom made) are usually used, or the bone defect reconstruction performed by applying the Ilizarov method. Next, I would like to describe two types of benign bone tumors, such as the Olie disease and multiple exostosis disease which causes shortening, bending and deformation of bones and joints, as well as rigidity of the nearby joints. The correction of these problems using the Ilizarov method is a unique and a nearly perfect way to restore the limb function. 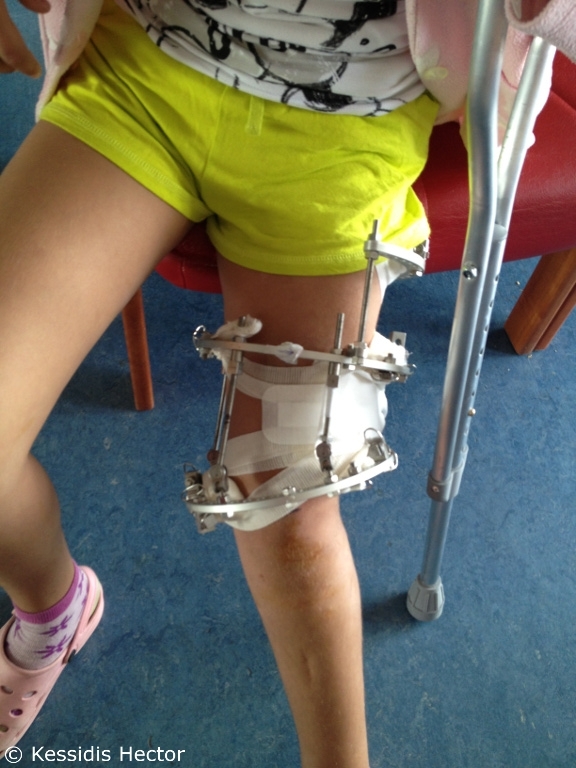 A 6-year-old female patient presented with shortening and curvature of the left lower limb. The medical history reveals that she suffers from a benign tumour of the pelvis, the left femur and the tibia, as well as from Ollie disease (enchondroma). The disease leads to development arrest and curvature of the affected limb. On examination the shortening was 4 cm, with 1.5 cm in the femur and 2.5 cm in the tibia. At the first stage it was decided to extend and correct the deformity of the left femur. The elongation achieved was equal to 3.5 cm. The duration of treatment was five months. One year after the first operation, despite of the achieved extension of the hip, the shortening of the left leg was more than 5 cm. At this stage, the surgery performed aimed at lengthening the left tibia by 7 cm, which made the length of the affected leg 2 cm longer as compared to the normal one. In the future, until the age of 15-16 (the age of skeletal maturation), repeat surgeries are required in order to regain the length of left lower limb lagging behind in development.